(Nanowerk News) For future astronauts, the process of suiting up may go something like this: Instead of climbing into a conventional, bulky, gas-pressurized suit, an astronaut may don a lightweight, stretchy garment, lined with tiny, musclelike coils. She would then plug in to a spacecraft’s power supply, triggering the coils to contract and essentially shrink-wrap the garment around her body. The skintight, pressurized suit would not only support the astronaut, but would give her much more freedom to move during planetary exploration. To take the suit off, she would only have to apply modest force, returning the suit to its looser form. 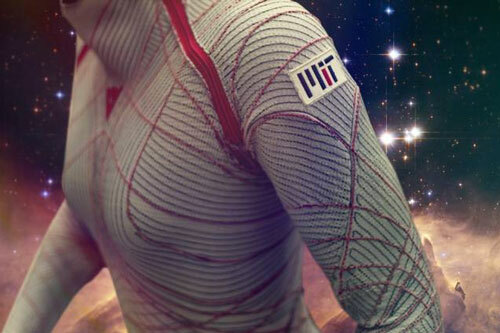 Now MIT researchers are one step closer to engineering such an active, “second-skin” spacesuit: Dava Newman, a professor of aeronautics and astronautics and engineering systems at MIT, and her colleagues have engineered active compression garments that incorporate small, springlike coils that contract in response to heat. The coils are made from a shape-memory alloy (SMA) — a type of material that “remembers” an engineered shape and, when bent or deformed, can spring back to this shape when heated. The team incorporated the coils in a tourniquet-like cuff, and applied a current to generate heat. At a certain trigger temperature, the coils contract to their “remembered” form, such as a fully coiled spring, tightening the cuff in the process. In subsequent tests, the group found that the pressure produced by the coils equaled that required to fully support an astronaut in space. The coil design was conceived by Bradley Holschuh, a postdoc in Newman’s lab. Holschuh and Newman, along with graduate student Edward Obropta, detail the design in the journal IEEE/ASME: Transactions on Mechatronics ("Low Spring Index NiTi Coil Actuators for Use in Active Compression Garments"). While skintight spacesuits have been proposed in the past, there’s been one persistent design hurdle: how to squeeze in and out of a pressurized suit that’s engineered to be extremely tight. That’s where shape-memory alloys may provide a solution. Such materials only contract when heated, and can easily be stretched back to a looser shape when cool. To find an active material that would be most suitable for use in space, Holschuh considered 14 types of shape-changing materials — ranging from dielectric elastomers to shape-memory polymers — before settling on nickel-titanium shape-memory alloys. When trained as tightly packed, small-diameter springs, this material contracts when heated to produce a significant amount of force, given its slight mass — ideal for use in a lightweight compression garment. The material is commonly produced in reels of very thin, straight fiber. To transform the fiber into coils, Holschuh borrowed a technique from another MIT group that previously used coiled nickel-titanium to engineer a heat-activated robotic worm. Shape-memory alloys like nickel-titanium can essentially be “trained” to return to an original shape in response to a certain temperature. To train the material, Holschuh first wound raw SMA fiber into extremely tight, millimeter-diameter coils then heated the coils to 450 degrees Celsius to set them into an original, or “trained” shape. At room temperature, the coils may be stretched or bent, much like a paper clip. However, at a certain “trigger” temperature (in this case, as low as 60 C), the fiber will begin to spring back to its trained, tightly coiled state. The researchers rigged an array of coils to an elastic cuff, attaching each coil to a small thread linked to the cuff. They then attached leads to the coils’ opposite ends and applied a voltage, generating heat. Between 60 and 160 C, the coils contracted, pulling the attached threads, and tightening the cuff. The group’s next challenge is finding a way to keep the suit tight. To do this, Holschuh says there are only two options: either maintaining a constant, toasty temperature, or incorporating a locking mechanism to keep the coils from loosening. The first option would overheat an astronaut and require heavy battery packs — a design that would significantly impede mobility, and is likely infeasible given the limited power resources available to astronauts in space. Holschuh and Newman are currently exploring the second option, looking into potential mechanisms to lock or clip the coils in place. As for where the coils may be threaded within a spacesuit, Holschuh is contemplating several designs. For instance, an array of coils may be incorporated into the center of a suit, with each coil attached to a thread that radiates to the suit’s extremities. As the coils activate, they could pull on the attached threads — much like the strings of a puppet — to tighten and pressurize the suit. Or, smaller arrays of coils could be placed in strategic locations within a spacesuit to produce localized tension and pressure, depending on where they are needed to maintain full body compression. While the researchers are concentrating mostly on applications in space, Holschuh says the group’s designs and active materials may be used for other purposes, such as in athletic wear or military uniforms.